When we made our big move last year, a bunch of my baking supplies went MIA. I've been patiently waiting for them to reappear-- They're probably stashed in a box marked "office supplies" or "stuffed animals". However, last week when I was making zucchini bread with a single 1/4 cup (and having to count 16 scoops of flour! ), I decided it was time... 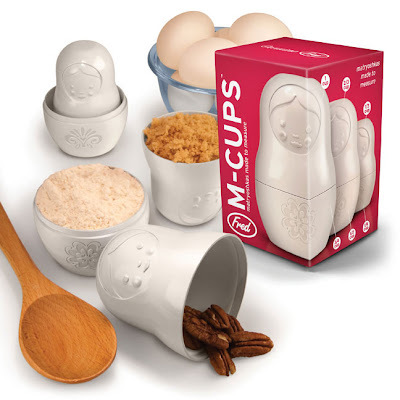 I love these cute and functional Matroyshka measuring cups! Now I just need to convince Happy Vee that they're not his toys!